Disney Traditions statue spotlights Simba, Timon, and Pumbaa! Inspired by Disney's The Lion King. Interchangeable parts let you display young Simba or grown Simba! "Hakuna Matata. It means no worries for the rest of your days!" Bring home this colorful 15-inch wide x 7 1/2-inch tall x 4-inch deep statue inspired by Disney's classic movie The Lion King. 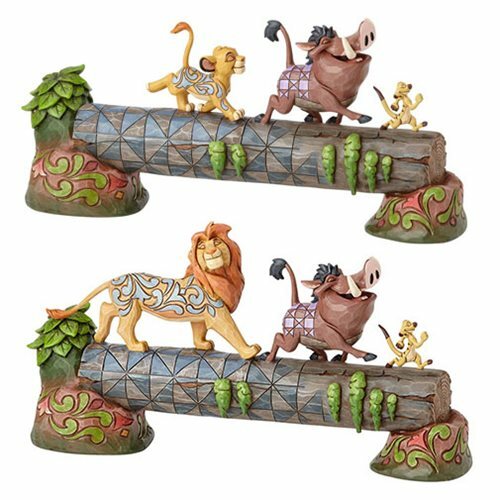 The amazing Disney Traditions The Lion King Simba Timon and Pumbaa Carefree Camaraderie Statue is made of stone resin and comes with 2 interchangeable top halves, one featuring young Simba and the other with grown Simba! Age 15 and up.